WASHINGTON — Stratolaunch has performed the first test-firing of a key component of a rocket engine it is developing as the company presses ahead despite the death of its founder and principal funder. In a Nov. 6 statement, the company said that it fired the preburner for its PGA engine Nov. 2 in a test at NASA’s Stennis Space Center in Mississippi. The preburner serves as the smaller of two combustion chambers in a staged combustion engine. Stratolaunch emphasized the use of advanced technologies in development of the preburner, notably additive manufacturing. 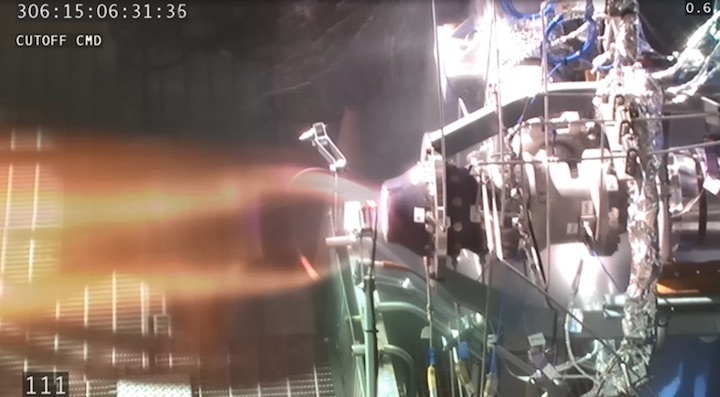 That enabled “rapid prototyping on a much faster scale than traditional methods” for the engine, allowing the company to go from engine design to the hotfire test in less than one year. The company unveiled its plans for the PGA engine in September. The engine will use liquid oxygen and liquid hydrogen propellants with fuel-rich staged combustion and a thrust of 200,000 pounds-force. At the time of the September announcement about the engine, Stratolaunch said it was planning a first full-scale test of the preburner by the end of the year. The engine is intended for use in a family of vehicles Stratolaunch plans to develop for launch by its giant aircraft currently undergoing taxi tests. An initial “Medium Launch Vehicle” will be able to place 3,400 kilograms into low Earth orbit, with a first launch projected for 2022. The company is also studying a “Heavy” variant with a payload capacity of 6,000 kilograms, as well as a crewed spaceplane. The PGA engine is named after Paul G. Allen, the Microsoft co-founder who announced the founding of Stratolaunch in 2011. Allen, who previously funded development of Scaled Composites’ SpaceShipOne suborbital spaceplane, passed away Oct. 15 from cancer. The death of Allen, who has been the principal funder of Stratolaunch, has raised questions about the company’s future. In a statement at the time of his death, Vulcan Inc., the holding company that oversaw Allen’s ventures including Stratolaunch, said that plans had been developed for continuing his various ventures after his passing, but has not disclosed details.